Over half of all Americans ignore this safety warning; what is it? Over half of all Americans ignore the safety warning and still don't wash their produce (fruits and vegetables). Congratulations to Cassie Stock of Knightstown, IN for being the first to correctly answer the Impossible Question! 67% of all employees wish their supervisor wouldn’t do this; what is it? 67% of all employees wish their supervisor wouldn’t share the details of their personal life with them! Congratulations to Samantha Dawson of Richmond for being the first to correctly answer the Impossible Question! 15% of all people say that this was the most magical moment in their life; what is it? 15% of all people say that passing their drivers test was the most magical moment in their life! Congratulations to Greg Conley of Richmond for being the first to correctly answer the Impossible Question! Thirty years ago most people could do this whereas today only about 10% of all people can do it; what is it? Thirty years ago most people could read roman numerals whereas today only about 10% of all people can read roman numerals! Congratulations to Tracy Fields of Portland, IN for being the first to correctly answer the Impossible Question! Women are twice as likely as men to do this at work; what is it? Women are twice as likely as men to take their shoes off at work! Congratulations to Nicki Maiola of Richmond for being the first to correctly answer the Impossible Question! 25% of all women admit to commonly using this to improve their appearance; what is it? 25% of all women admit to using photo filters to improve their appearance! What will immediately put you into a good mood? The number one answer was “finding money in a pocket,” followed by (blank); what is it? The number one thing that will put you in a good mood is finding money in a pocket followed by sleeping in with no alarm! Congratulations to JoEllen Crawley of Richmond for being the first to correctly answer the Impossible Question! 10% of all people admit that they will not eat this; what is it? 10% of all people admit that they will not eat leftovers! Congratulations to Jennifer Phillips of Centerville, IN for being the first to correctly answer the Impossible Question! 6% of all women admit that they are turned on by a man that drives this; what is it? 6% of all women admit that they are turned on by a man that drives a UPS truck! Congratulations to Rhonda Avery of Winchester, IN for being the first to correctly answer the Impossible Question! Only 1 in 5 people that have a job also have one of these; what is it? Only 1 in 5 people that have a job also have a business card! Congratulations to Ashley Bowling of Richmond for being the first to correctly answer the Impossible Question! Three quarters of all people say you shouldn’t do this after turning 48 years old; what is it? Three quarters of all people say you shouldn’t wear skinny jeans after turning 48 years old! Congratulations to Kristen Wright of Richmond for being the first to correctly answer the Impossible Question! 43% of all people admit that they have gone an entire week without doing this; what is it? It’s something that you usually carry with you, especially if you are leaving the house. 43% of all people admit that they have gone an entire week without using cash, only their debit or credit card! Congratulations to Rick Allen of for being the first to correctly answer the Impossible Question! 56% of all people admit to commonly doing this while watching Netflix; what is it? 56% of all people admit to commonly drinking wine while watching Netflix! Congratulations to Kelli Wilkinson of New Castle, IN for being the first to correctly answer the Impossible Question! 60% of all women say it’s a major turnoff when a man does this; what is it? 60% of all women say it’s a major turnoff when a man winks at them! Women do this three times more often than men today whereas fifty years ago it was the complete opposite; what is it? Women take photos three time more often than men today whereas fifty years ago it was the complete opposite! Congratulations to Maddie Lyall of New Castle, IN for being the first to correctly answer the Impossible Question! Nearly 20% of all men admit that they have not gone a second date with a woman because of this; what is it? Nearly 20% of all men admit that they have not gone on a second date with a woman because of the way she smells, typically her perfume! Congratulations to Misty Burton of Lynn, IN for being the first to correctly answer the Impossible Question! 41% of all people admit that this is one of the first things they do immediately following a break-up; what is it? 41% of all people admit that they change their social media profile picture immediately following a break-up! 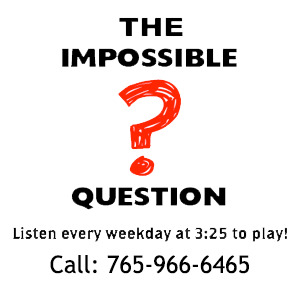 Congratulations to Tiffany Gabbard of Connersville, IN for being the first to correctly answer the Impossible Question! Nearly 25% of all married people have kept this secret from their spouse when this happens; what is it? Nearly 25% of all married people have not told their spouse that they received a traffic ticket! Congratulations to Becky Doerflein of Richmond for being the first to correctly answer the Impossible Question! 30% of all people agree that this is one of the worst things about going to the doctor; what is it? 30% of all people agree that getting on the scale is one of the worst things about going to the doctor! Congratulations to Judy Retz of Winchester, IN for being the first to correctly answer the Impossible Question! After a bad day, 8% of all people say this is their favorite thing to do; what is it? After a bad day 8% of all people say eating mac & cheese is their favorite things to do.